UNITED NATIONS, Sep 11 2017 (IPS) - Taken together, the 2030 Agenda for Sustainable Development (SDGs) and the Paris Agreement on Climate Change, provide humanity with a masterplan for a sustainable way of life on this planet. If we maintain our fidelity to this masterplan, we will end extreme poverty and create economic growth and prosperity that is more equitably shared both between and within countries. And in so doing, we will empower billions of women and girls; advance human rights and reduce the risk of violent extremism. Most importantly, we will restore balance to our relationship with the planetary ecosystem, both on land and in the Ocean, while addressing the realities of Climate Change. We set the bar high with the Agenda because conditions, both today’s and those to come, demand that we do so. Thus the goals we have set ourselves present enormous challenges and require of us huge transformations of systems and behavior. Their realization demands political foresight, collaboration and the deployment of resources, expertise and technology on a scale that has perhaps never before been seen. But we do have these qualities and resources. Potentially, we have reserves of them sufficient to well exceed the goals before us. Thus it is a matter of deployment, of marshalling our forces, both morally and practically, to undertake the tasks at hand in a spirit of inclusivity and universality. In these early years of the 2030 Agenda, it is essential that we generate an unstoppable momentum towards the way stations of 2020 and 2025, and ultimately on to our 2030 destination. In November last year, I presented to you my PGA plan to generate such momentum. As you know, I assembled a high-quality team of SDG experts within my office, supported by Chef de Cabinet, Ambassador Tomas Anker Christensen, my Special Adviser on SDGs, Ambassador Dessima Williams, and the PGA’s Special Envoy on SDGs and Climate Change, Ambassador Macharia Kamau, to help me implement that plan. Over the course of the last twelve months, we have pursued activities to bring progress to each of the 17 SDGs. This work has been captured in the report prepared for today’s meeting, a copy of which should now be with you. I will summarize a sample of those activities now, by talking to three main streams of work. The first work-stream relates to SDG Advocacy. In order to keep the SDGs at the top of the global agenda, my office travelled to 32 countries across every region of the world. This was a time-consuming exercise, and I particularly want to thank Ambassadors Kamau and Williams for putting in the hard yards attained. From COP22 in Morocco to Habitat III in Ecuador; from the World Bank Spring Meetings in Washington to the World Economic Forum in Switzerland and the OECD in France; from the African Union in Ethiopia to the European Union in Belgium, to the Belt and Road Forum in China and to the SIDS Symposium in the Bahamas, we were present at the forefront. We visited the UN Offices in Bangkok, Nairobi, Vienna, Rome and Geneva to convene with them on the Sustainable Development Goals. On each occasion, we drove home our key 2030 Agenda messages, urging all actors to get on board the SDG train, to get the wheels of implementation turning, and to join the journey to a better world by 2030. During the 71st session, we placed particular focus on engaging young people, believing them to be the most effective agents of transformation given the importance of the 2030 Agenda to their lives. We met with groups of young people at every given opportunity and I wrote to every Head of State and Government encouraging them to incorporate the SDGs into national school curricula, making a similar request to the heads of over 4,000 universities. In addition, we strove to bring the attention of the global public to the SDGs. As part of this effort, we organized a series of SDG Media Zones to allow the global social media community to engage with leaders and speakers at the High Level Week in September and other High Level Meetings. All this to burn the candle of enlightenment better and brighter. The second work-stream has focussed on generating collaboration across a range of SDGs. Here, we convened a host of meetings in New York and elsewhere. You will recall the five SDG Action Events convened during the resumed session. Cognizant of the busy GA, ECOSOC and Security Council schedules, many of these action events were organized back to back with other meetings. In March, we held a meeting with UNFCCC on the SDGs and Climate Change. It was hugely reassuring to observe at this meeting that the great mass of humanity, along with the governments that lead us, are united behind the Paris Agreement. The meeting made clear that proactive Climate action will have direct positive impacts across all of the SDGs, with a lack of Climate action having the opposite effect. In April, with a view to identifying the steps required to unlock the massive resources required by the 2030 Agenda from international private finance, we held an SDG Financing Lab. This event illustrated how different goals require different sources of finances; how action must be taken to bring key financial stakeholders together on a UN platform to get investments flowing; and how the financial system must be aligned with the SDGs in order to facilitate the financing of the Goals. In May, we held a memorable meeting on Innovation, kick-starting a reflection on how the UN system and Member States alike can embrace innovation for the benefit of SDG progress. We concluded that the fourth industrial revolution will be a boon to the 2030 Agenda, but that we must manage both the benefits and the risks associated with exponential technological change. As we engaged with both the worlds of finance and technology during the 71st session, it became clear to us that there is a strong demand from outside the UN for a port of call, a docking station at the UN, for partnerships to be structured in support of the implementation of the SDGs. And then in June, to bring a fresh spirit of collaboration and action to one of the most crucial SDGs, we held the SDG Action Event on Education and SDG 4. The meeting brought together key stakeholders to discuss what it will take to realize the Education Goal, looking at financing needs, at empowering youth, at education in humanitarian and emergency settings as well as at education for sustainable development, and at how connectivity and exponential technology advances can transform the way we educate for progress. Finally, there was The Ocean Conference, held in support of the implementation of SDG14. Working with the Co-Chairs, Fiji and Sweden, with DESA, OLA, DOALOS, UNDP, UNEP, FAO, IOC and the entire UN membership, agencies and programmes, we raised global consciousness on the plight of the Ocean and produced a huge work plan of solutions from the congregation of world expertise assembled. The conference generated almost 1400 voluntary commitments for Ocean action and a global community of actors now committed to working with us in reversing the cycle of decline in which the Ocean has been currently caught. I am very proud of what The Ocean Conference achieved. Ahead lies the implementation of the work plan, with the necessary discipline of the proposed 2020 UN Ocean Conference to work towards in support of SDG14. The third work-stream has been the implementation of SDG-related mandates within the General Assembly. Here, resolutions were passed on key issues like the Technology Bank for LDCs, and the Global SDG Indicator Framework. Lengthy consultations were conducted on the alignment of the GA Agenda with the SDGs, and important GA meetings were held on the UN’s response to individual SDGs such as those relating to biodiversity, water and urbanization. During the session, we advanced preparations for major meetings on SDG-related matters including migration, human trafficking, and South-South cooperation. Having analyzed and reflected on what we have busied ourselves with during the 71st session, I draw a few key conclusions that I would like to share with you. First, I believe that together we have generated momentum across the SDGs. Through our advocacy efforts, the New York element of the 2030 Agenda has been properly applied to ensuring the SDGs are at the forefront of the global agenda. Through our SDG action events, we have brought new actors to the table and encouraged those already involved to collaborate more actively with others. And through our work here at the General Assembly, we have strengthened the overall architecture for implementing and following up on the SDGs, and broadened global awareness of the SDGs. Second, based on our experience and on all of the above-mentioned efforts and more, the outlook for SDG implementation is positive. Headway is being made in many key areas, as captured in this year’s UN SDG Progress Report. Governments have made great strides in incorporating the SDGs into their national development plans, as was further evidenced by the strong interest in voluntary national reviews at this year’s HLPF. Meanwhile it is heartening to see the business sector becoming increasingly aware of the SDGs and expressing a desire to play an active part in their implementation. Progressive actors in the financial world see that the future is green and that the 2030 Agenda presents incredible investment opportunities. An army of innovators are at their keyboards and in their labs ready to unleash their ideas and new technologies to support the SDGs. And civil society actors, many of whom helped us to conceive this masterplan, are ready to push us forward day in day out. Here at the UN in New York we see positive signs. The High Level Political Forum is growing in strength year on year. The appointments of Secretary General Guterres; of DSG Mohammed; of UNDP Administrator Steiner; and of UN DESA’s Mr Liu and many more, means that the UN has recruited an inspiring team to lead the charge of the 2030 Agenda. The Secretary General’s report on the UN System that was released in July demonstrates his resolve to do what is needed to ensure the UN is fit to discharge its mandates to best effect and to better support Member States in realizing the SDGs. In this regard, I urge Member States to get behind the Secretary General’s efforts, to look beyond the pain of short-term changes and embrace the systemic shift needed to move us closer to the achievement of our universal goals. My third conclusion is not yet an alarm bell, more in the nature of an early morning wake-up call. Two years after the momentous adoption of the 2030 Agenda, implementation is not yet moving at the speed or scale required to meet our ambitious goals. Progress on individual goals is at best uneven, as evidenced on the ground where it matters most. This mixed picture is reflected across regions, between the sexes, and among people of different ages, wealth and locales, including urban and rural dwellers. Thus a much greater focus on leaving no one behind, on empowering women and girls, young people and vulnerable groups is asked of us at all levels. UN DPI, the SDG Action Campaign and Project Everyone are diligently performing their respective roles in bringing the SDGs to the people. But popular awareness of the SDGs at individual and community levels across the world remains far too low. This is a serious flaw, for without knowledge of the rights and responsibilities inherent in the SDGs, people are not directly motivated to work on the transformations of thought and action the 2030 Agenda requires. To correct this, further emphasis is needed in national plans and policies – be they in the global North or South – to better promote the central demands of the 2030 Agenda. These should include a focus on inclusion; an integrated approach across the three dimensions of sustainable development; and an emphasis on participation, transparency and accountability. As indicated in the Secretary-General’s report, big gaps also exist in the UN’s current approach, particularly in the areas of partnership, finance, data and innovation. More broadly, it is clear that we have yet to see the levels of collaboration and collective action that helped governments make major inroads on the MDGs. There is clearly a need for a more systematic approach to SDG partnerships and collective action across the range of SDGs and the UN has a critical role to play in making this so. The Ocean Conference demonstrated the power of bringing together a wide-range of actors to support the implementation of a particular SDG, and this model can be replicated elsewhere. Similarly, we have yet to witness the dramatic shift in financing and global economic policy that is necessary to align the financial system with the SDGs. The Addis Ababa Action Agenda must be implemented, say it loud and say it clear. A shift away from unsustainable investments and a surge of private investment into developing countries, particularly in areas such as energy and infrastructure, is urgent business at hand. We need to see a significant increase in development assistance; a dramatic improvement in global tax cooperation; and meaningful review of macroeconomic policies to align them with the SDG’s focus on inclusion and sustainability. The UN has a more proactive role to play in promoting these issues, given its status as a trusted convener. 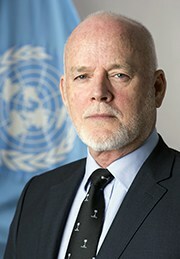 In conclusion, the UN needs to build a capacity, a docking station capacity, to convene, engage and create coalitions for collective action across the Means of Implementation, be it partnerships with the private sector, harnessing the potential of exponential technological change or convening the titans of public and private finance to support achieving the SDGs. During the 71st session, we tried to leave no stone unturned in the search for SDG momentum. I want to thank you, the Member States, for your support and good advice throughout. For those among you who at my request took on onerous roles of facilitation and chairmanship, I applaud you here in front of your peers. I congratulate the Secretary-General and Deputy Secretary-General for grasping the baton of responsibility and leadership without breaking stride. I thank UN DESA and many other parts of the Secretariat, especially those in the field in the service of the UN system, for putting their shoulders to the wheel; likewise, the wonderful team at the Office of the President of the General Assembly for doing all that was possible to keep us moving forward on the 2030 Agenda. As you begin your preparations for the High-level week of the 72ndsession, I urge you to give this message to your capitals: we have achieved momentum on the SDGs, but there can be no rest. To get to the promise of the 2030 Agenda, we now need a shift in gears. It is time to crank it up a notch, for time is not on our side. The message should also be that we find ways to collaborate better with non-governmental actors. Partnerships at times may involve risks, but if we partner right and partner strong, the rewards far outweigh them. And the message should include strong support for the Secretary-General in bringing forward his reforms of the UN System, so that we are in best possible shape to help others along the journey to 2030. We have the resources, the ideas, the technology and the motivation. Add leadership, courage and an unwavering commitment to progress and we will reach our 2030 destination with goals fulfilled. As I have said many times, together we are strong. When it comes to the 2030 Agenda for Sustainable Development, we succeed or fail together, for we are addressing the sustainability of our planetary ecosystem, the integrity of our global economic system, and the equity of humanity. We will not fail because we love our grandchildren. We will succeed because we have not come this far only to be defeated by greed.